Avoiding Your Kids Responding - You're Not Listening! Listening is one of those skills that really doesn't seem like it's all that difficult. Why then do so many children report that their parents don't listen to them? Maybe it's because there are many ways to unintentionally stop conversations with your kids. These traps are so easy to fall into that you may not even realize something has gone wrong until your child walks away in a huff. It’s easy to respond to your children in ways that shutdown the conversation. 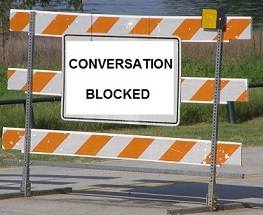 In his book People Skills, Robert Bolton identifies conversation 12 roadblocks. Criticizing: "That wasn’t a very smart thing to do." Name calling: "You are such a brat!" Diagnosing: "The reason you drag your feet on getting your chores done is that just you want to upset me." Praising Evaluatively: "You’re the best player in the school. The tryouts will be breeze for you." Diverting: "It’s not that big a deal. Let’s talk about something more pleasant." Logical arguments: "You only weigh 80 pounds. You are not overweight." Reassuring: "There’s nothing to worry about. I’m sure you’ll remember your lines in the play." Ordering: "You need to study at least two hours every night." Threatening: "If you don’t stop complaining, I’m never taking you here again!" Moralizing: "Kind children do not act that way." Excessive/Inappropriate Questioning: "Why did you do that? What were you thinking?" Advising: "You’d have a lot more friends if you were a little more positive." Bolton suggests that whenever someone is experiencing stress you should especially try to avoid these roadblocks. However when you or your kids are under stress, it is extremely easy to accidentally use these conversation roadblocks. Let’s take a look at a couple examples where parents ended up using one of these roadblocks. Here’s another situation where the parent ends up using a conversation roadblock. In this case the parent jumped to solving the problem which left the child not feeling heard. Instead the parent could have tried validating the child’s feelings by responding “It sounds like you felt sad after that happened.” The child might reply “No, I was mad so I kicked Chris. He tattled on me so I had to sit down the rest of the time.” By focusing on the child’s experience and avoiding conversation roadblocks, the child has the opportunity to say what’s on his mind. Good listening takes time, patience and attention. You can't fully listen while also watching TV or working on the computer. Communication involves not only words but also body language, eye contact and tone of voice. So in order to understand your child's message, you need to both hear the words and watch how they are said. Even though you may not agree with your children’s behavior you can always acknowledge their feelings. When you communicate your understanding of your child’s situation, you are showing empathy and your child is likely to feel heard. Being a good listener takes practice. Try spending five minutes today listening to your child. No interruptions, no advice, no lectures, no roadblocks. Just listen and watch how your child responds to your undivided attention.